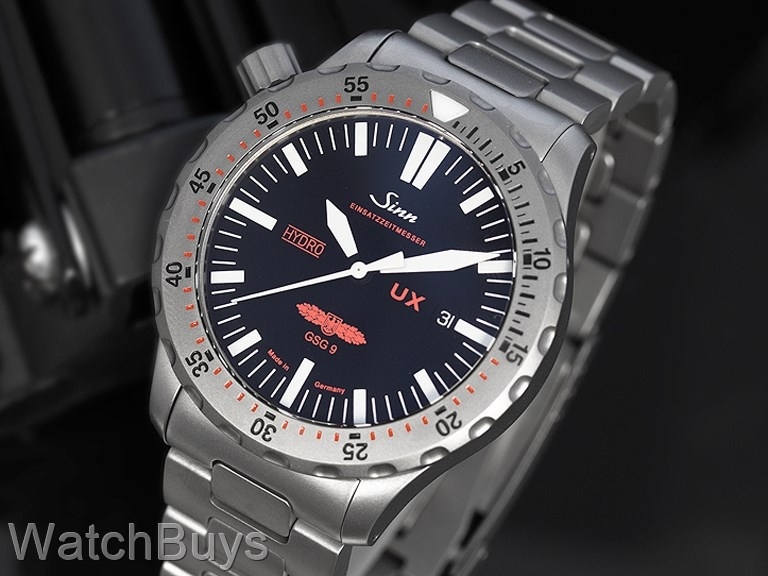 This is a special release of the Sinn UX, and is designed for the elite German Grenzschutzgruppe (GSG9) special forces unit in underwater tactical operations. Notice the dial design and the crown placement on the left side of the watch. The Sinn UX pushes watch technology to the limits. Like the Sinn U1 and U2 watches, the Sinn UX GSG9 features a case made from the same submarine steel that is being used to build the latest generation of German military submarines. The steel was procured by Sinn from a steel supplier to Emden GmbH, one of Germany’s North Sea shipbuilding yards who construct submarines from the very same steel. Unlike the Sinn U1 and Sinn U2, the Sinn UX GSG9 features a quartz movement rather than a mechanical movement. By using this type of movement, Sinn is able to fill the watch with oil, which has the double affect of greatly enhancing the readability of the dial and time from any angle (including under water), and increasing the water resistance of the watch even at great depths. The special battery used to power the movement has an expected life of seven years before needing to be replaced. The Sinn UX GSG9 is covered with a thick sapphire crystal for extreme protection. This sapphire crystal features a special anti-reflective coating that is scratch resistant - the coating itself has been hardened to 1,800 HV. This watch is designed for operation in extreme temperature variations - it operates in temperatures between -20° Celsius to +60° Celsius. The movement is water resistant to 5,000 meters, and the case is pressure tested to a diving depth of 12,000 meters as certified by Germanischer Lloyd in Hamburg. Other features include sapphire crystal with anti-reflective coating, and stainless steel bracelet. Verified Owner Comments: Awesome. Good looking, solid tank of a watch. Fits my 7 1/8 wrist perfectly. Highly recommend. Verified Owner Comments: Wonderful experience from start to finish. Thanks to Rob and everyone else at Watchbuys for a seamless transition. I was in contact with a representative every step of the way. To include a follow up call a day after the watch arrived to ensure it was delivered on time and answer any questions I had. "Sinn UX EZM 2 B GSG9"
Verified Owner Comments: I love this watch. I have now owned 2 of them. The first I sold in a weak moment, but missed it so badly I had to buy another. I have had Rolex, Omega, Fortis, several other Sinn's, whatever but this is the best I have ever owned. "UX EZM2B GSG9 is a Battleship!" Verified Owner Comments: At 44mm, I thought this watch might be too large for my average size wrist. (40mm seems to be a sweet spot for me.) Sinn designed this case to fit comfortably, yet it doesn't look oversized. This U-Boat Steel watch is a Battleship! It's my indestructible, absolutely glare free, every day watch. Verified Owner Comments: I bought this watch after attending a Road Show in Austin. The UX was not even on my radar but after seeing it in person, I had to add it to my collection. If you want something cool and unique, the UX is for you. I was concerned that 44mm might be gaudy or too big but it is just right. The watch is beyond solid and feels like it was crafted from a single billet of steel. I sprung for a tegimented bracelet and am very happy with it. There is a disclaimer on the web site about the color of the tegimented bracelet not exactly matching the watch case but the difference is negligible. In fact, the bezel is tegimented and the bracelet matches perfectly. This is my daily wearer and I could not be happier. Thanks to "Road Show" Rob and everyone at Watchbuys for hooking me up. I could not be happier!